As a result of my recent dealings with the 16th century Lutheran theologian Heshusius (biography and overview of Isaiah 40), I also came across his commentary on 1 Timothy (Helmstedt: Jacob Lucius, 1586). The acquaintance would have probably remained a passing one were it not for the first 12 words of the Argumentum (Overview) on folio 1, and especially the first two words – Res ardua, “An arduous business.” This opening clause struck me as a masterpiece and convinced me it was a good idea to continue working through the overview (folios 1-6), especially in view of a forthcoming conference isagogical paper on 1 Timothy that has been assigned to me. Any faithful, experienced pastor or teacher in the Christian Church will find the entire first paragraph of Heshusius’ overview below to be one of the best and most gripping summaries of the public ministry of the gospel on record. However, when one considers that he wrote it in 1586, two years before his death at age 60 and after getting kicked out of at least seven ministerial positions (one of which expulsions took place at 3 a.m. without thought for his “very pregnant wife”) and resigning from another position of his own conscientious accord, its brilliance and force come as considerably less of a surprise. Heshusius has what many modern commentaries on 1 Timothy lack, an extremely practical “Occasion for Writing” that actually grabs at the jugular, as Luther would say. This is an overview and introduction that proceeds not just from the head and heart, but also from a lifetime of faithful adherence to the letter’s content. I ask the triune God that he would use the overview that follows to encourage public ministers of the gospel to revisit the treasury of the Pastoral Epistles, and to spur them on to increased faithfulness and diligence in their holy calling, to the glory of our Savior Jesus Christ. The ministry of the gospel is an arduous business, and a task as extremely difficult as it is sublime – the ministry by which we propagate the knowledge of the true God among the human race, call sinners to repentance, and set forth the heavenly blessings of the Son of God. For this kind of teaching is unknown to human reason and is placed beyond our comprehension. The kingdom of Christ itself, whose cause we serve, is detested by the world and subject to the animosities of the mighty. Not only is our own weakness immense, so that we easily get worn out, but the adversarial spirit also never ceases in his attempts to trouble us, to deter us from duty, to impede our progress, and to dislodge us from the position of faith. Sometimes he exposes us to the violence of tyrants; other times he shrouds us in the false accusations of heretics. We are neither sufficiently safe among our own hearers, nor are we immune from great hardships among colleagues. And since perpetual dangers and all kinds of misfortunes surround the Church, instructing the simple, counseling the troubled, strengthening the faint, and comforting the weak is a considerable task. It also takes a lot of work and exceptional diligence not only to present the teaching about God and eternal life plainly and distinctly, but also to refute the authors of false opinions with firm testimonies of Sacred Scripture, after the causes of the errors have been shown, and to stabilize those who are wavering in faith. The Holy Spirit calls pastors and bishops of churches sons of mighty heroes: “Ascribe to the Lord, sons of mighty men, ascribe to the Lord glory and strength” (Psalm 29). For they must engage in constant battle, not with one kind of enemy, but with various and manifold enemies. On one occasion furious tyrants proceed against them with open force; on another poisonous heretics try to suppress them with ruses and deceptions. Sometimes arrogant and fanatical teachers make life difficult for them; other times false brothers and treacherous colleagues cause very serious dangers for them. We must also contend against our own flesh, which is easily seduced by the world’s charms, is dragged away from the path of righteousness by perverse emotions, lets its resolve in work that has been undertaken be broken by human ingratitude, and which is troubled in faith by the delusions of Satan. Since then the difficulty of the evangelical task is so great, Paul, who had left Timothy behind at Ephesus and entrusted the Asian churches to his care, wanted to equip and fortify him with doctrine, counsel, and authority, so that he would preside over the church of God faithfully and wisely. Nor indeed does Paul have Timothy alone in mind. No, he wishes to instruct all bishops and pastors in the apostolic spirit, so that they may know what faith and good judgment, what attentiveness and moderation, what patience and mental fortitude needs to prevail in the house of the Lord and is needed for governing the Church of the Son of God. It takes a lot of good judgment, moderation, and teaching to conduct civil government in such a way that a great number of humans are able to be held together in peace and proper discipline. But it takes far loftier wisdom and teaching to preserve the Church of Jesus Christ in knowledge of the true God, in purity of doctrine, in sincere worship of God, in confession of the truth and patience in afflictions. Therefore, in order that the universal church might have a prescribed form for this beneficial administration, and that each individual pastor might be admonished by the divine voice, the apostle Paul relates the precepts of Jesus Christ. For he had not only learned from extensive experience and years of practice what exactly was required for beneficial governance of the church, but he also had this understanding by virtue of the apostolic spirit. For the Son of God had set Paul apart as the distinguished vessel of choice for instructing the entire Church. So let us then read this epistle as if it were the voice of the Holy Spirit, and let us realize that he is issuing commands not just to Timothy, but to all bishops and pastors. He opens the letter with a serious admonition to avoid new and foreign doctrines and to guard against fables and prying questions, which are usually produced by people of ambitious nature. They indeed trouble the church more than they build it up. With this admonition he censures the fanatical teachers who were disparaging Timothy’s authority as a young man and were ingratiating themselves with the people through their inquisitive disputations. And right after that, he sets forth the summary of the whole of Christian doctrine, and he shows to what end all of Christ’s doctrine is passed down – namely, of course, that love may be manifest in us, from a pure heart, a good conscience, and an unfeigned faith. Those who deviate from this goal show that they do not understand what they profess. He then gets down into the parts of the heavenly doctrine, and he first teaches that the law is good and how it is to be used, that it has not been put into place for the just man, but for the unjust and disobedient, to restrain them and keep them attentive to their duty. It is therefore not to be turned upside down and used for a person’s justification. To the law he subjoins the doctrine of the gospel, and in order to present it with the utmost clarity, he establishes himself as a singular example of this doctrine: In him everyone may see that the eternal God admits sinners into his favor free of charge, out of boundless mercy, since indeed he himself had been a blasphemer, reviler, and bitter enemy of the pious and had still found mercy. In order to indicate the basis for this comfort, he teaches that Jesus the Son of God came into this world for the very purpose of saving sinners. And he testifies that his own example has been set out for the whole church, that each individual might believe in the Mediator and obtain eternal life. Having presented the doctrine of the law and of the gospel in summary fashion, he encourages Timothy to prove himself its faithful steward and teacher, to wage the good warfare, keeping faith and a good conscience. And so that this serious admonition might strike Timothy’s heart more deeply, he brings in the tragic examples of Hymenaeus and Alexander, who had made a shipwreck of the faith and had been handed over to Satan. After the solid foundation for the doctrine has been laid, the chief point of piety, of true faithfulness in the ministry of the gospel, is arduous and constant prayer, both for all ranks and for public officials in particular. For if we are not constantly praying to the Lord, piety is not putting down roots in us and the struggles we are undergoing in the ministry of teaching are not producing any fruit at all. He explains that the will of God is that all people find salvation. Therefore the gospel of Christ should be set out for all people and we should pray for all people. And as there is one God, so there is one Mediator and one way of salvation that God has revealed from heaven, and of this doctrine he has been appointed by God as a herald and an apostle. Nor indeed does he want pastors and bishops alone to compose prayers to God, but also the hearers themselves. And he also teaches that impure emotions and doubts ought to be far removed from the prayers of the saints. To wives [matronis] he commends the pursuit of piety through propriety, modesty, and obedience, and he shows that the task of teaching in the Church is not proper for them. He teaches that woman was deceived first, but that salvation still exists for wives if they remain in faith, love, purity, and moderation. In the third chapter he describes in many words the task of a true bishop and pastor. He explains what virtues and what gifts are required in him, what sort of men are to be elected to the position, and to what sort of men the care and governance of the Church should be commended. In so doing he indicates at the same time what sort of men should be passed over in an election. He also explains what sort of men ought to be deacons of the Church and with what kind of character they ought to be endowed, and he wants their faith and doctrine to be tested by examination first, before a public task in the Church is committed to them. He also shows what virtues are required in the wives of bishops and deacons. And in order to incite the deacons to maintain faith and diligence, he teaches that faithfulness is honored by God with a remarkable reward. Furthermore, in order that exceptional diligence in and attention to administration in the Church might be kindled in Timothy and all other pastors, he explains how sublime the glory of the Church is: He says that it is the house1 of the living God, the pillar and foundation of the truth. And to make this point more striking, he explains the chief article of our faith, that God was made a human, which is the foundation of our entire salvation. In the fourth chapter he prophesies in the Spirit of the unhappy times to come, in which many are going to reject the faith, how people driven by fanatic spirits are going to trouble the church with destructive teachings, prohibiting marriage, distinguishing between foods. And after he has refuted these false teachings, he urges Timothy to commend these warnings to the pious brothers and to keep away from profane and absurd fables. He incites Timothy and all pastors instead to occupy themselves with the sincere pursuit of piety, which is adorned with far greater promises than with physical exercises, which are weakened with use. He teaches that the hope of the future life has been laid away for us, and that we toil and undergo abuse for this, that we put confidence in the living God. He urges Timothy and all bishops to be unremitting in setting forth sound doctrine; leading the way for their hearers by their good example in love, spirit, purity, and faith; being diligent in reading, exhorting, and teaching; kindling new gifts in themselves and, through the exercise of piety, augmenting the gifts they have; and constantly persisting in purity of doctrine and faithfulness of duty. For he shows that this is the way they will find salvation. In the fifth chapter he instructs Timothy what propriety and gentleness he ought to exhibit toward older men and colleagues, what kindness toward those of the same age, what modesty and purity toward married women. He then gives precepts that detail which widows are to be acceptable recipients of the Church’s ministration.2 He wants widows to be chosen who are of advanced age and have the endorsement of good works. He wants the younger ones to marry, to raise children, to manage a household, and to pursue propriety. He then commends the elders to Timothy’s care. Timothy is to regard them with reverence, to show them every courtesy, and to see that they are given a respectable salary, since those who are keepers of doctrine are indeed worthy of every honor and of just reward. He warns that accusations against elders are not to be readily entertained without attestation; those openly doing wrong are to be rebuked so that the others fear for themselves. He charges Timothy with instruction and governance by solemnly adjuring him before God and our Lord Jesus Christ and the holy angels not to sin through prejudice or yield to his own affection, nor to share in the sins of another by laying hands on someone quickly and without examination. Finally, he builds Timothy up with comfort, lest he torture himself excessively. He tells Timothy that he will not be able to remedy every evil all at once or to ward off every harmful pest. Though he will detect the hypocrisy and wicked schemes of some but will be unable to convict them openly, it ought to be enough for him to denounce and punish manifest crimes. The obscure ones will have to be tolerated until they are at last brought to light and to judgment by God himself, for God will not suffer them to lie hidden forever. He also shows that noble deeds get their praise in the end. Even if good and faithful pastors, who devote themselves entirely to serving the salvation of the Church, should be degraded by falsehoods, oppressed by resentment, and falsely accused, nevertheless innocence cannot be suppressed, but gets its due praise in the end. In the last chapter he commands slaves to show obedience and honor to their lords, lest their lord refuse to listen to the Christian teaching3 on their account. He forbids them from despising their masters or refusing them obedience on the pretext of religion. After he has explained the doctrine that he wants Timothy to set forth continually with the utmost faithfulness, he subjoins a warning about the false teachers to be avoided, and he describes their character and fruits so that they can be recognized and distinguished from pure teachers that much more readily. And since greediness is a special mark of false teachers, he deals with it more sharply and he urges Timothy not to let it have a place in him, but to be content with the necessities of life, which God will not deny us. He appends an exhortation to righteousness, piety, faith, love, endurance, and gentleness, and to fortitude in the ministry of the Spirit, so as to obtain the eternal life in Christ. He adjures Timothy in the presence of God and of Christ to maintain faithfulness in the ministry, to keep the doctrine uncorrupted, and to comply with Paul’s admonitions. Last of all, he enjoins them not to rely on their riches nor to be proud or grow haughty on account of them, but to put all their hope in the eternal and living God and to pursue good works, to practice generosity, and to have a view toward eternal life. He once again admonishes Timothy to take great care to avoid the latest profane chatter and the tendency to dispute, and instead to faithfully guard the deposit, that is, the doctrine he has received from Paul. 1 I am reading domus for Dominus. 2 The Latin sentence could also be translated: “…precepts about the widows to be admitted to the ministry of the Church.” But this makes it seem as though Paul was giving stipulations for widows who would regularly serve the Church as deacons or in some other official capacity, whereas Heshusius makes it clear in his commentary proper that these widows would in fact receive care, protection, and provisions from the ministers of the Church (cf. folio 236). 3 I am reading doctrinam for doctrina. My first introduction to Tilemann Heshusius (also spelled Heshus or Heshusen) was in either Survey of Theological German or European Lutheran German Writings – two courses I took at Martin Luther College. From time to time the professor would hold Fluffstunden or “fluff classes,” so named because we had no homework due for those classes. In the “fluff classes,” he would tell us about the life and work of various famous Lutherans, usually the Lutheran author of whichever work we happened to be working through at the time. I recently had the opportunity to glean from Heshusius’ knowledge in preparation for a sermon on Isaiah 40:31. God willing, I will post the fruits of that labor later this week. In the process, I thought it would also be a good idea to review Heshusius’ life, which was indeed characterized by battles with Crypto-Calvinism, although I was unable to confirm the story of his physical altercation. Crypto-Calvinists were Calvinists posing as Lutherans who undermined and weakened especially the biblical (and Lutheran) teaching about baptism and the Lord’s Supper. The definitive biography on Heshusius is Johann Georg Leuckfeld’s Historia Heshusiana oder Historische Nachricht von dem Leben, Bedienungen und Schrifften Tilemanni Heßhusii (Quedlinburg and Aschersleben, 1716), available at the Post-Reformation Digital Library. Lacking the time to translate Leuckfeld, I opted to work through “Tilemann Heshusius’ Leben,” a relatively short piece that was copied from the preface of an 1862 reprint of one of Heshusius’ works and printed in the October 29, 1862, issue (vol. 19, no. 5) of Der Lutheraner (ed. C. F. W. Walther). The endnotes below are my own. Men like Heshusius always make me as a pastor wonder just how soft we American Lutherans have become in adhering to and defending the truth. May the Lord of the Church use the example of Heshusius at the very least to urge us on to a more zealous promotion and defense of the true and pure doctrine of his Word. Tilemann Heshusius, the author of this little book, not only generally occupies a place among the most learned, brilliant, godly, and experienced theologians and among the most forceful and faithful warriors for the pure doctrine of Luther in our church, but it was precisely many of his particular experiences that taught him especially how important it is that the right to call and depose preachers be administered by those to whom God himself has awarded it in his word, namely, by the church or congregation. The entire life of our Heshusius was namely, as Heinsius notes in his church history, “an almost continual wandering,” and in fact for this reason in particular: At his time partly the secular government and partly the so-called religious leaders [Geistlichkeit] almost exclusively arrogated to themselves all ecclesiastical authority, and especially the authority to call and depose public ministers [Kirchendiener]. If this authority had been in the hands of his congregations, who mostly stuck by him as a highly gifted and zealous preacher of God’s word, then he would not have taken the walking stick in his hand as often as he did, and would not have had to experience the distress of abandoning his cherished congregations and surrendering them to false teachers. The life and activity of our Heshusius occurred mainly in that period immediately after Luther’s death, during which the Crypto-Calvinists (that is, the secret, disguised Calvinists) were infiltrating many Lutheran churches, while the faithful followers of Luther were using all kinds of tricks in an attempt to eliminate them from their positions, and in the process were getting secular authority on their side. Now the more zealously Heshusius held tightly to the jewel of the pure Lutheran doctrine and to the church discipline that was grounded in it and continued to expose and battle for his flock the wolves in sheep’s clothing that had snuck in everywhere, those wolves were all the more furious in assailing him and causing him every sorrow one can only imagine, along with their fellow party members. One counts at least seven exiles which this valuable witness had to endure during his life for the sake of the truth. He was born on November 3, 1527, in Wesel in the Duchy of Cleves. After he had attended various German and French universities, he became a master in 1550 at the University of Wittenberg, and a doctor of theology there in 1553, after he had already become superintendent in Goslar the year before.3 But since he would not discharge his ministry according to the instructions of the burgomaster of Goslar, he experienced his first exile here as a result of the burgomaster’s intrigues. This happened in 1556; yet he received a call to Rostock as preacher and professor of theology that same year. Here too he only had a resting-place for a short time. Controversies arose over the introduction of a better Sunday celebration and over the abolition of certain papistic ceremonies that were still being retained there. Here too Heshusius found the burgomaster to be a decided opponent, who also finally brought it about, even against the duke’s will, that Heshusius had to leave the city after only a year had passed. But still in the same year (1557) he received the honor of being a professor primarius, a president of the church council, and a general superintendent in Heidelberg. Scarcely had he taken up these positions when he got wrapped up in a harsh battle with the Calvinists who had infiltrated there, particularly with his deacon, named Klebitz, a battle which ended yet again with his deposition in 1559. He then became superintendent in Bremen, but since the council there would not dismiss the Calvinist Hardenberg, Heshusius himself resigned and went from there to Magdeburg, where in fact he received the pastorate at the Church of St. John in 1560 and the position of superintendent in 1561. But he would not refrain from publicly testifying against the Crypto-Calvinists, Synergists, and others, and he felt compelled to pronounce the ban on the city council. So finally in 1562, after he continued preaching in spite of the prohibition he had received, one day (it was October 21) he was suddenly and forcibly conducted out of the city in the middle of the night.4 He then stayed for a while in Wesel, the city of his birth, until he also had to withdraw from this city in 1564 on account of his stern writings against the papists. 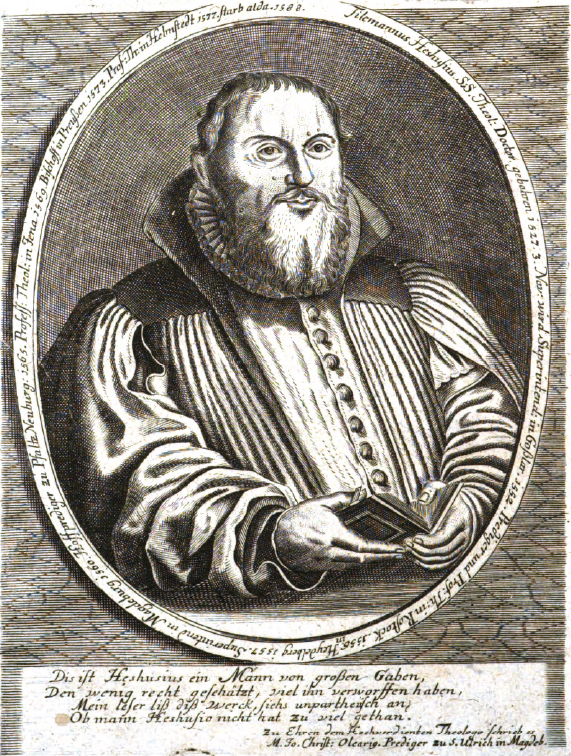 Now after he had lived for a brief period in Frankfurt, he became court preacher of the Count Palatine of Zweibrücken in Neuburg, then in 1569 professor of theology in Jena until 1573, when he was again dismissed from his position on account of his zeal against Crypto-Calvinism, but was soon thereafter chosen to be the Bishop of Samland. But this honor was also taken back away from him already in 1577 on account of a theological controversy with Wigand. After he had then withdrawn to Lübeck for a brief period, he followed a new call to be professor primarius in Helmstädt, where he then remained until his blessed end, which followed on September 25, 1588. In 1578 he had had the misfortune of falling into a cellar, as a result of which he had to limp until his death. For those who are unfamiliar with the period in which Hehusius lived and with the intrigues of the enemies of the pure Word that were rampant within the Lutheran Church at that time, Heshusius may appear to be a quarrelsome man judging from what precedes. But anyone familiar only with Heshusius’ Little Prayer Book [Betbüchlein], for example, will soon note that, while this cherished man was engaged in a constant battle with men that was forced upon him, he was living in the peace of God and finding in God’s lap the rest that the hostile world was denying him. 1 The book was advertised in the October 15 issue thus: “The following little book has just been published: Who Has the Authority, Eligibility, and Right to Call Preachers? By Dr. Tilemann Heshusius. 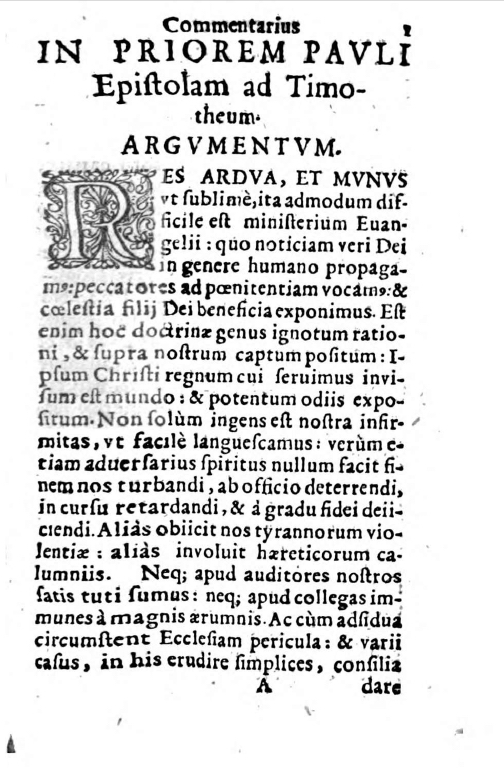 Printed unaltered according to the original edition of 1561. St. Louis, Mo. Publishing House of L. Volkening. 1862” (p. 32). The reprinted book was 40 octavo pages [Seiten] and cost 15 cents. 2 This promise was made in a footnote. 3 This accords with Leuckfeld’s biography (p. 4-5), but according to the Real-Encyklopädie für protestantische Theologie und Kirche (2nd ed. ), Heshusius became superintendent of Goslar in 1553 and obtained his doctorate on May 5, 1555. A footnote at this point in the Der Lutheraner article says that around this time Heshusius married the daughter of the well-known zealous theologian Simon Musaeus, but he did not marry Barbara Musaeus until 1566 after he was widowed. His first wife was Anna Berthen, the daughter of the burgomaster of Wesel. 4 Leuckfeld says that the border warden (Marckmeister) and 30 to 40 armed citizens invaded Heshusius’ parsonage property, and they “occupied house, property, garden, and everything, so that no one could get out or in, while nearly 500 fully armed citizens had to be stationed at the door, since he [Heshusius] was then forcibly driven out of the city by them at three o’clock at night as far as the cloister [bis zur Cluß],* along with his very pregnant wife, whose developing child [Frucht] they also did not spare even in the womb” (p. 33). * Cluß appears to be a variant for Klause, which means cell, cloister, hermitage, or (narrow) mountain pass.